The tea ceremony was loved by each successive Lord Maeda after the first, Toshiie, learnt it from Sen-no-Rikyu. The third lord, Toshinaga, invited the fourth Tea Master of the Ura-Senke, Senso Soshitsu, to provide instruction. As a result of his influence, the Kyoto potter Chozaemon came to Kanazawa, and founded Ohi Pottery. Along with the spread of the tea ceremony, Japanese confectionary, reflecting the seasons, developed. Traditional industry such as lacquerware, metalwork, and dyeing and weaving were also born in the castle town, and are carried on today as Kaga Yuzen (dyeing and weaving), gold leaf work, and the crafting of household Buddhist altars. 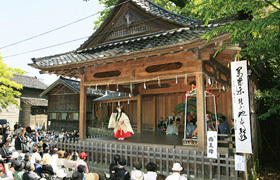 The third lord, Toshitsune, and the fifth lord, Tsunanori, invited the best silversmiths and lacquer artisans from Kyoto and Edo to develop arts and crafts in Kanazawa. Tsunanori set up a crafts workshop in the castle, making armour and furniture and other items, increasing the skills of local artisans. 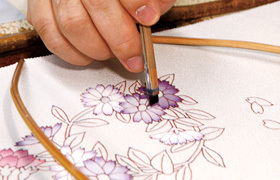 The traditional artisanship of these is still carried on at the Utatsuyama Craft Workshop. 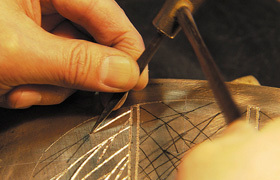 Also, in order to pass on the traditional techniques of Kanazawa and train new people, the Kanazawa Artisans University was founded in 1997, and has been active in areas like the restoration of Kanazawa’s historical remains.